THE SAN ANTONIO Spurs and Cleveland Cavaliers took 3-0 leads in their respective NBA play-off series on Friday. 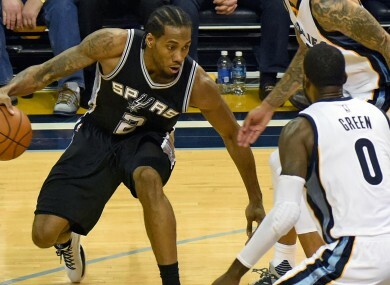 The Spurs rallied past the Memphis Grizzlies 96-87 at FedExForum to be on the verge of a sweep in the Western Conference first-round series. Kawhi Leonard starred for the Spurs with a game-high 32 points, while LaMarcus Aldridge had a double-double of 16 points and 10 rebounds. Danny Green and Manu Ginobili contributed 11 points each, with the Spurs outscoring the hosts 26-16 in the fourth quarter. Zach Randolph (20 points and 11 rebounds) and Matt Barnes (17 and 11) tried hard for the Grizzlies. The Cavs are 3-0 up against the Detroit Pistons after a 101-91 victory in game three. Kyrie Irving (26 points) led the way in terms of points, while LeBron James (20 points and 13 rebounds) and Kevin Love (20 and 12) had double-doubles. The Pistons had a more even contribution with five players in double-digits, but they are set for an exit in the Eastern Conference. The Boston Celtics pulled back to a 2-1 series deficit against the Atlanta Hawks courtesy of a 111-103 win. Isaiah Thomas had 42 points to see the Celtics to their win at TD Garden. Email “The Spurs, Cavs cruise in play-offs”. Feedback on “The Spurs, Cavs cruise in play-offs”.